*Rain Plan: Meet at Varsity Theatre on Franklin St.
COMING SOON: Culture of Honor. This BOOK will change your whole perspective on relationships & the Christian life! Order the book today on Amazon, read on your own & join Janet’s book club every Wednesday at 7 pm for 12 weeks. Email Janet at jobanobet@aol.com. Start date TBA. Wednesdays: Financial Peace University. Learn how to start a budget, pay off debt, invest for the future & build wealth. Men & Women, young & older . . . all welcome to join us every Wednesday, starting January 9th for a proven biblical method on financial peace, while building great friendships. Email Deanna at deannadrescher@gmail.com. 3rd Thursdays: Worship @ the Loeb’s House! April 18th. Don’t you love to just take time to get lost in the “swirl” of God’s heart in worship?! Join us every 3rd Thursday at the Loeb’s. For address, email Donna at ejdjloebs@gmail.com. Fridays: UNC Wellspring. Fiery, passionate Worship @ UNC!Students join us every Friday in lifting up the name of Jesus over UNC @ McCorkle Place! This is such an important hour and key location. Chapel Hill is in turmoil over the Silent Sam controversy, but the Spirit of Peace & Love reigns over our campus. Email Michael at phamm89@gmail.com for more info. 1st & 3rd Sunday Mornings. Middle & High School students, join us in the classroom down the hall at church after worship on April 7th & 28th for an incredible series on “establishing foundations in the faith” w/ Janet Moore. Food will be served every meeting! 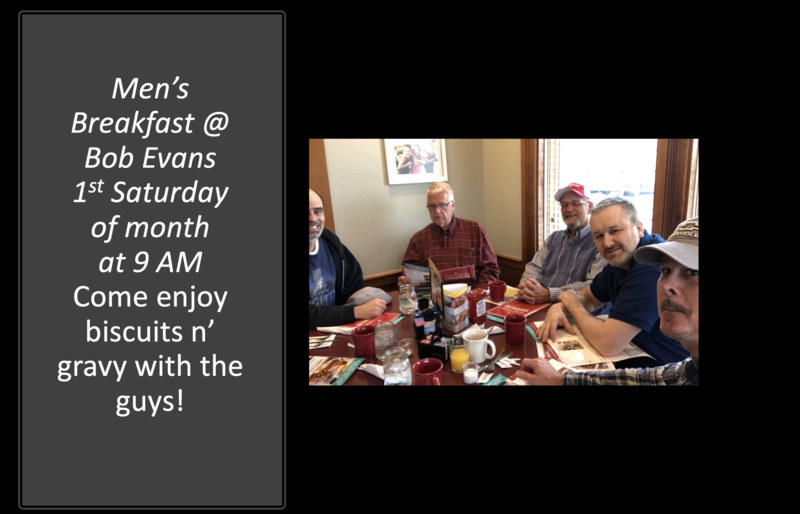 1st Saturdays: Men’s Breakfast. Join us at Bob Evans on 15 501 between Durham and Chapel Hill for some biscuits n’ gravy and great conversations. ​For this and other info about our church, follow us on Instagram, @riverlife_chapelhill, & Facebook.